File Check Standard Check Your files will be automatically checked for the most common issues (for example missing bleed, wrong format). If issues are detected, they will be repaired automatically, if possible. Professional Check Our experienced artwork staff will perform an extensive check on your file. If issues are detected, we will inform you via phone about any changes. You can find more details here. Proof Print You will receive a physical proof print delivered. This normally takes 2-3 working days. The proof print has to be signed and sent back to us. Please note, that the delivery date will be delayed, and that proof prints are not laminated. Our vinyl flex outdoor material is perfect for your X-Stands. The material used is durable and sturdy, ensuring that you can make use of your printed X-Stand for a long period while leaving a high-resolution visual impression for your business. As standard, your X-Stand banner will come with grommets, i.e. the eyelets that will allow you to fix and install it. The X-Stand itself (which will keep the banner standing up) is available as an extra. Why You Should Print X-Stands for Your Business? Due to their support frame, X-Stands have limited stability compared to Roll-Ups for instance, and are therefore best suited for indoor advertising. There are a couple of standard uses for which X-Stands are extremely appropriate, and you definitely have encountered them already. 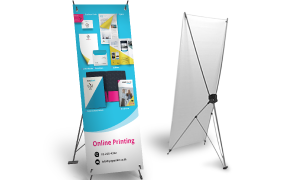 First, if you are having an important sales presentation, attending a sales fair or business exhibition, or keeping a stand or booth at any other kind of indoor event, we advise you to print X-Stands to increase the visual impact on other people. X-Stands are an extremely valuable medium for transmitting your marketing message, as they are basically a banner for indoor use, that stands on its own and can be re-used times and times again. If you are a business that attends these events every once in a while, printing X-Stands is a solid investment that will definitely pay off. 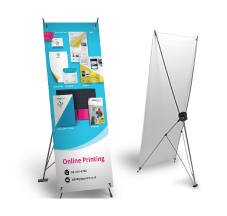 In addition, you can print X-Stands at low cost with Gogoprint, meaning that you can print a couple of designs to tailor your marketing message to the target audience of the event that you are attending. Furthermore, you can also print X-Stands if you own a store, restaurant, bar, or coffee shop. Indeed, they are perfect to advertise special promotions and/or new additions to your product and services selection. For instance, you can set up an X-Stand near the entrance to advertise your new menu, and/or explain the benefits that can be enjoyed with your new membership card. You could also print an X-Stand to provide ample information about a product or service that you just added to your offering. Most important is to design and print X-Stands with the same goals and objectives in mind as posters. You can read this blog post for detailed recommendations. X-Stands are such a valuable marketing and sales medium because they offer a variety of advantages. First of all, they are extremely light and therefore easy to store, transport, and set up. In addition, the material that they are printed on and the mandatory glossy or matte lamination ensures that X-Stands are both durable, and easy to clean and maintain. In addition, the production process and material used allows for the printing in high resolution, perfect for sharp images and text that can be spotted from far away. When you print X-Stands with Gogoprint, lamination is standard, and grommets come as part of the X-Stand banner as well. Gogoprint relies only on the highest quality printing equipment to ensure that you can print awesome and high impact products at a low cost. As with Gogoprint’s other products, you do not have to worry about picking up the products, as delivery is always free for Java and Bali. We offer a broad range of products on qualitative paper, with premium refinements. Instantly view prices in the configurator! Order our paper sample booklet to experience the quality. Download a pdf quotation in just one click for the product you configured. Prices remain valid for 14 days! Enjoy FREE delivery all over Java & Bali. Delivery is always next-day or same-day, so you receive your products latest the day after production finishes. Configure, order, pay, and upload your files through our easy-to-use website. Standard artwork check is included to ensure that your file is 100% print-ready. Configure, check prices, order, and upload files 24/7! Contact us anytime by email or website chat and we will get back to you ASAP. You can also call our team between 8:30AM and 8PM every weekday. If you are a business or organization that meets our requirements, enjoy credit terms on your orders. As a company with frequent orders, enjoy special conditions agreed upon with your account executive.